According to traditions, Imam al-Mahdi (A.S.) was born in the middle of the month of Sha’ban, 255 A.H. and has been alive for more than twelve centuries. Even though living to such an age is against the norm that exists among the people of the world, the possibility of having an extended life has been solved and is therefore probable and believable. Now, we would like to take a look at the phenomenon of the extended life span from different points of view. The main belief among the Shiite and Sunni scholars is this that Jesus (p.b.u.h. )is alive. He remained in the heavens in the same state he was in on the earth. He went up to the heavens, did not drink of the sherbet of death, and will not do so until he descends at the end of the time on the earth and recites his prayers behind al-Mahdi (p.b.u.h. )1 So according to the Christian era, Jesus should be around 2000 years old. 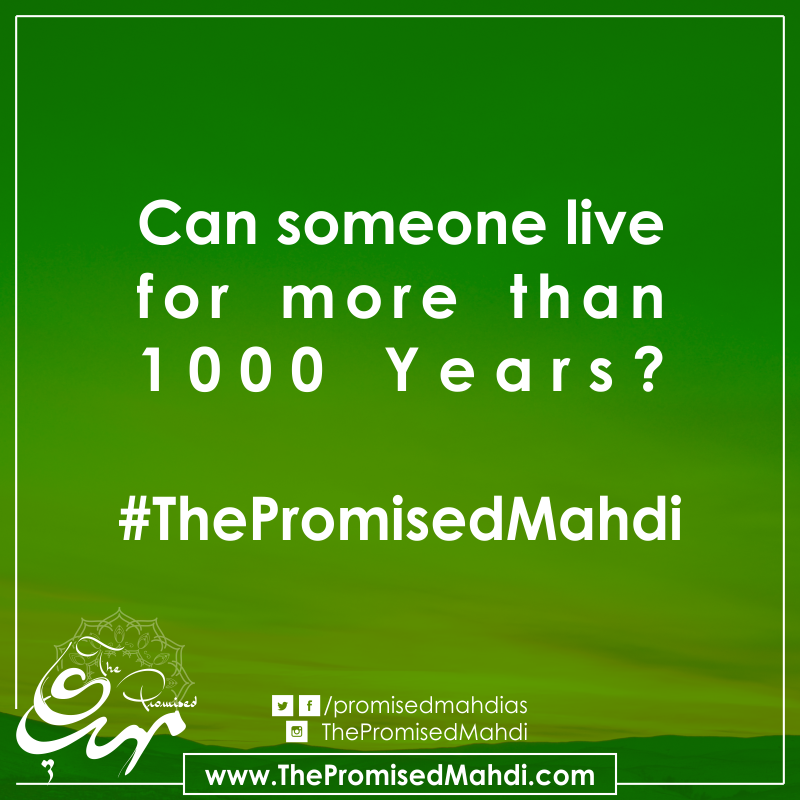 With this in mind, al-Mahdi’s age of 1150 years should not be impossible to consider. Another person who has had an extended life span is the great Khidhr (p.b.u.h.). He is undoubtedly one of the divine Prophets. The miracle of his existence, which God had bestowed upon him, was that wherever he sat and wherever he went, no dried out or withered plant would remain in that state. In his presence, everything would become green and full of life. For this very reason, his name in Arabic is ‘Khidhr’ which means ‘green’. Even though he hasn’t been mentioned by name in the Holy Qur’an, the meeting between this wise experienced servant of Allah with Moses (p.b.u.h.) and the company he kept with him has been mentioned in the 20th chapter of the Holy Qur’an, al-Kahf (The Cave). Qur’anic commentators and interpreters (from both the Shiite and Sunni sects) have claimed that in verse 65 of al-Kahf, the phrase, “servant of Allah” refers to Khidhr (p.b.u.h.) 2. Other people mentioned in the Holy Qur’an for their extended life spans are the People of the Cave. As you can see, the Holy Qur’an mentions their having stayed alive for three centuries-without food or water in a deep sleep. Which is more amazing? Someone who has remained alive for three hundred years without food or water, or someone who has stayed alive for hundred of years, but eats food, drinks water, walks, sleeps and wakes up? Traditions from the Holy Prophet of Allah prove the possibility of an extended life span in humans. One of the people pointed out in the Prophet’s (p.b.u.h.) traditions for his long life span is the Dajjal. The Sunnis according to this tradition, believe that the Dajjal was born around the Prophet’s time and will continue to live until the end of the time. In addition to the Holy Book and the traditions, the sound judgement does not eliminate the possibility of extended life spans in humans, rather actually considers it a possibility. Intellect tells us that being careful about our health and hygiene can extend our life span, while not doing so can shorten it. Philosophers and theologians have stated that the best reason for the possibility of something is the actual occurrence of that thing. This proof shows that because throughout history there have been recorded incidences of extended longevity, its recurrence would be possible from an intellectual point of view. The third category, it is usually rejected out because it is unnatural and abnormal. We can see instances (in real life) where this takes place, such as the ill being cured by prayer. An extended life span can be looked at in the same way. It, too, seems hard to believe because it is something rather unnatural and abnormal, although the possibilities for its occurrence and existence are high. The miracles of the Prophets (which prove their righteousness) are along the same lines. Jesus’ curing the blind, Moses’ transforming his cane into a serpent, and Muhammad’s (p.b.u.h.) splitting the moon in the sky; all done by the order and permission of the Creator are categorized as supernatural. So, from the intellect and logic point of view, there is no reason to say that humans must have a limited life span and cannot possess an extended one. Another fact that should be considered is the long history of humankind. If extended longevity had occurred at all, although not many, then, the repetition of the similar case or cases would have been deemed natural, logical and acceptable. It is obvious that narrations throughout history, especially those which have become known and familiar have implanted certainty and belief in us as to its possibility. We can see that history books have mentioned many people who have had longer life spans than usual, in many cases detailing their biographies and ways of life. They include average people as well as the Prophets and great personalities in history. This evidence corroborates the possibility of the extended life span making it definite and absolute. As we have seen, the Holy Qur’an, the noble traditions, intellect, and history, provide proof of the possibility and the existence of extended longevity. This has been documented and officially recognized. In addition to what we have discussed, another factor that proves that humans can have extended life spans is the miracle and power of God. Without a doubt, Imam al-Mahdi (A.S.) is not an average person; in fact he is the very special individual. As the noble Prophet of Islam had said: “He is the representative of ,God.” Therefore, God, Who deemed it proper (and also has the ability) to keep His enemies such as the Dajjal and Satan alive for such a long time, could do the same for his humble servant and representative on the earth. Ganji Shafei’i wrote: “This (heavenly) order by coincidence has let three people remain (on the earth) two of them are pious, one of whom is a Prophet, the other, an Imam and the third, the Dajjal, is the enemy of God. Now that it has been made clear that the extended life span of Jesus and the Dajjal is true and such a thing exists, we should accept the same for the al-Mahdi (p.b.u.h.). This is in addition to knowing that al-Mahdi(p.b.u.h.) extended life span is solely according to God’s will and power. Philosophy states that there is a cause and reason for everything that is deemed possible. The effect does not exist until the cause comes into place. Everything that comes into existence needs a cause to become non-existent just as there should be a cause for everything that comes into existence. If there isn’t a cause for something to become non-existent, then the first cause continues producing its effect. From this we conclude that everything that exists has a cause as well as everything that becomes non-existent. When we have a cause for becoming existent, we need a cause to become non-existent, otherwise the existence will continue. Other living things such as plants and animals have also been observed to be different from others and have lived longer. For example, viruses can be considered the oldest beings. Viruses are amazing microorganisms, which if studied properly, may reveal the mystery of life. They are the cause of most illnesses in people, plants and animals. Archaeological findings show that viruses from over a hundred thousand years ago underwent development when put in cultures and still showed signs of life. Hibernation has been shown to greatly increase life span.11 Hibernators can be studied at the actual time of hibernation to show what factor prevails in increasing the life span. Hibernation occurs during the winter season, although some animals go through a similar process during the summer as well. When an animal hibernates, there is a decrease in its energy needs and its body metabolism drops by 30-100 percent. Its body temperature drops to the temperature of its surroundings so that the body doesn’t shiver and the skin and hair do not stiffen. It can drop to only a few degrees above freezing, the heartbeat slows down and the reflexes stop. Some animals may stay alive for long periods of time in extremely cold temperatures as some fish do in the Faeroe (islands NW of the Shetlands belonging to Denmark). Many living cells such as animal or human sperm (used for artificial insemination) or red globules (used for blood transfusion) can be maintained at freezing temperatures. Studying hibernation is especially intriguing because it can be a means of discovering the mystery of extended life spans. The existence of people with extended life spans proves that there is no limit on the length of human life with or without exceptions. It is true that the majority of people die before they reach a hundred, but because this is the norm does not necessarily mean that going over a hundred and beyond is impossible. A good number of people have also been seen to have gone past a hundred years in age. The existence of people who have easily reached ages ranging from 150-250 years makes it rather clear that limits to the human life span are not defined. It really doesn’t make a difference if someone lives for 200 years or 2000, for both are unfamiliar and uncommon. As a conclusion to the biological view, aging is not an irreversible incident rather it is an illness with a remedy. If the problem concerning extended longevity is asked by materialists, the answer is always the same. We have summarized the views of doctors, biologists, scientists and of history. On the other hand, if the matter is asked by the people of God and religion, two items are supplementary to what has been previously discussed. All theists believe in the unlimited power of God and that He has power over everything. God, Who has created the east and west and maintained over 200 billion galaxies for millions of years with His power, will never be weak to maintain his vicegerent on the earth. There is no dispute amongst theists and followers of Divine Religions about the possibility of extended longevity and that there is no limitation on the human life span. All of the Holy Books mention many instances of extended life spans which makes the issue very clear and certain for their followers. What we have discussed in this article is only a small portion of all the reasons and examples of extended longevity that the needs of this particular article could permit and we hope to provide better information and discussion on this topic in the future. 14. Scientists have discovered through extensive research and various experiments, that by freezing the human body they can extend the life span and that extremely cold temperatures also aid in this matter.